Supplemental Transactional Systems: These can improve business performance by detecting and reacting to business occurrences in real time. Mobile Apps Projects: These require up-to-the-minute data to maximize business results. Big Data Analytics Projects: Replication of data across systems ensures that data analysts are working with the same data. Data Synchronization: Anyone with master data management projects, data warehouses, analytical data marts, and mainframe environments will want to leverage data synchronization. Continuous Availability: To safeguard high availability for the most widely used transaction data stores, for cross-site workload balancing, and for disaster recovery. Attunity CloudBeam for S3, EMR and other Hadoop distributions simplifies, automates, and accelerates the loading and replication of data from a variety of structured and unstructured sources to create a data lake for Hadoop consumption on Amazon S3, including replication across Amazon Regions. Attunity CloudBeam simplifies and streamlines ingesting enterprise data for use in Big Data Analytics by EMR or other Hadoop distributions from Cloudera, Hortonworks or MapR as well as for pre-processing before moving data into Redshift, S3, or RDS. The NetApp Cloud Sync service provides a simple, automated method to get your data into Amazon Web Services (AWS), run an AWS service (such as EMR, Redshift, RDS) and get the results back on your premises. Cloud Sync is a complete data synchronization service to rapidly move your data to and from AWS while converting file-based NFS data to Simple Storage Service (S3) object format. 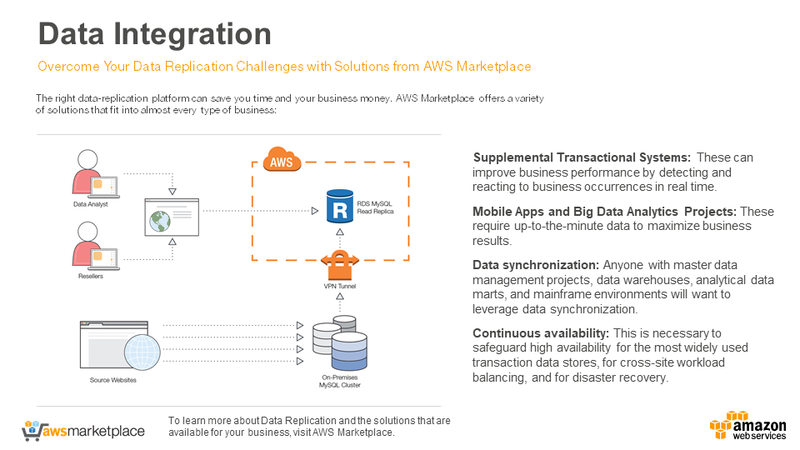 Informatica Intelligent Cloud Services for Amazon RDS provides native, high-volume connectivity to RDS. It is optimized for migration of on-prem databases to RDS and supports data integration, replication and synchronization with Oracle, MS SQL Server, MySQL enterprise/community editions and community edition databases. It allows you to develop and run data integration tasks (mappings), task flows and unlimited scheduling restricted to use only for RDS.